Pontiac, MI, October 03, 2018 — Gather your family & friends around your table and enjoy the beauty of this elegant yet nostalgic tablecloth everyday, or for special occasions. Featuring our original Great Lakes Map artwork. Generously sized at 60” x 84″ to fit a nice large table. Fabric is Linen-like, 100% Heavy Weight Polyester. Washes up beautifully and is sure to be an heirloom piece. 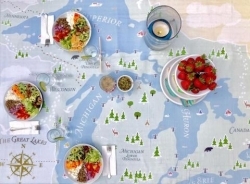 This Great Lakes Tablecloth makes a wonderful gift. These beautiful tablecloths are available to order right now on the Michigan Mittens' website below or you may visit Michigan Mittens at the Mitten Factory in downtown Pontiac at 111 North Perry Street at the corner of Perry and University.